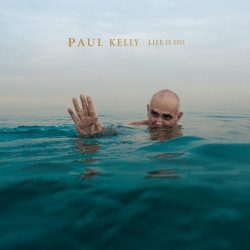 ‘Life is Fine’ as in ‘hanging by a thread’ rather than ‘great’, is a powerful return by Aussie songwriting royalty Paul Kelly. The Australian singer-songwriter is so pleased with it that he is about to embark on his first full band tour of North America to promote it. First listen to opening track Rising Moon will demonstrate why Kelly has such faith in “Life is Fine” as it’s a pretty irresistible R and B number and when the following tracks of Finally Something Good and the rocking Firewood and Candles kick in you can see how the variety of styles reflects the cohesiveness of the full band set up. Kelly has made clever use of guest vocalists Vika and Linda Bull. The former is in fine form to deliver the edgy blues song of My Man’s Got a Cold (which will have many a couple smiling knowingly) while Linda excels on a great reworking of Don’t Explain. This is an album that sees a fine song writer on top form throughout with other notable tracks being the effervescent Josephine and the quirky but haunting Roy Orbinson tribute Leah: The Sequel. Life is Fine and this album is very good. A fine slice of life from Australian singer-songwriter.